In a bowl, combine the ground meat, onion, garlic, egg, well-drained gluten-free crackers, soy sauce, Worcestershire sauce, salt and pepper. Heat the oil in a large skillet over medium heat. Shape the sliders, about 2 inches in diameter and 1/2 inch thick. Fry in the hot oil until golden brown on both sides, about 5 minutes. Transfer to a paper towel-lined plate to drain the excess oil. In another bowl, toss the mixed lettuce and vinaigrette. To make the yogurt sauce, combine all the ingredients. Mix well and set aside. Cut the iceberg lettuce in half and pick out the roundest leaves that can be easily stuffed. To serve, place an iceberg lettuce leaf on a plate and some of the lettuce and vinaigrette mixture in the center. 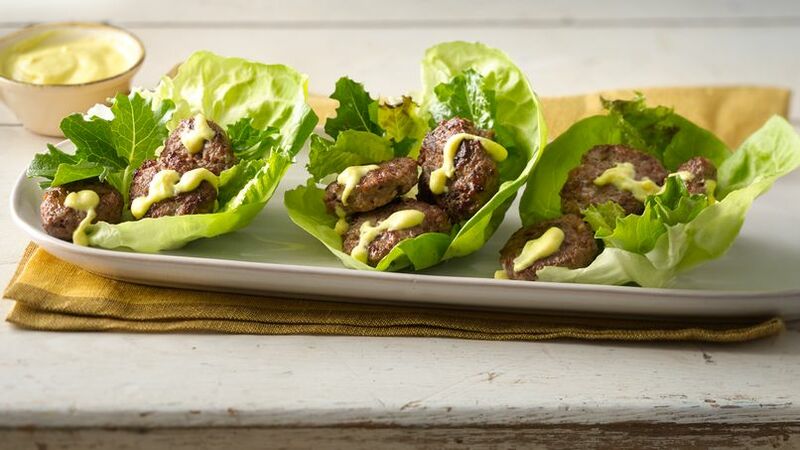 Place three sliders over it per serving, and top with a tablespoon of yogurt sauce (or to taste). You may also use beef, chicken or turkey. Morena Cuadra Several months ago, I visited a friend who's been on a very strict gluten-free diet for some time now. The idea was to make bison sliders, so I offered to make them and here's the recipe. I used iceberg lettuce because I like its crispy texture, but I also love using romaine lettuce or any other variety that might work to make flavorful veggie wraps. The yogurt sauce is simply spectacular. I also like to use it in many other ways, as a dip or to serve with chicken, fish, French fries or rice. It's very flexible!